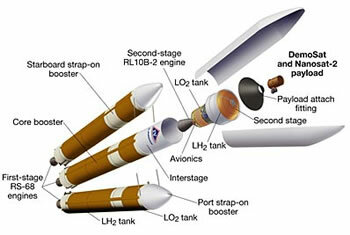 In the next few days, the new Boeing Delta IV Heavy rocket is expected to launch. 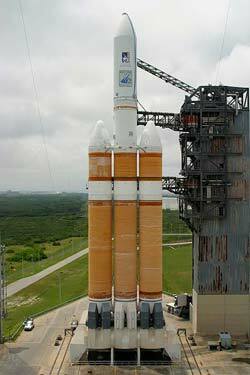 The 23-story tall Heavy was developed under the USAF Evolved Expendable Launch Vehicle (EELV) program. The vehicle's RS-68 core-stage engine is the first large, liquid-fueled rocket engine developed in the US in more than twenty years. The two strap-on booster cores will be jettisoned 100 seconds into the flight; the center core's RS-68 engine will burn for about 330 seconds, an increase of about 70 seconds over previous flights. This demonstration flight will carry an instrumented payload to measure vehicle performance. If you'd like to launch up to 28,000 pounds of real (not fictional!) payload into geosynchronous orbit today, you'd better take a look at the Delta IV Payload Planners Guide and updates page. If you would like to read about one of Robert Heinlein's smaller spacecraft, see the article on the Joy-Boat Junior, a sub-orbital craft very similar in function to SpaceShipOne - The First Strato-Yacht, which won the Ansari X-prize this fall.